Most people, other than the historically uneducated, will have heard of the first two names in my series, even if they don’t necessarily associate them with the same topics that I have. But today’s source of British values is far more obscure. And yet his influence is, arguably, far more widespread. Ebenezer Cobb Morley was, by profession a solicitor. Alongside his paid work, he also served as a county councillor and a magistrate. And, in his spare time, he was a keen amateur sportsman. Originally from Yorkshire, one of his first acts on moving to London at the age of 22 was to found (or take control of; historical sources are unclear) the Barnes Club, one of the oldest rugby football clubs in existence. On the water, too, he was a skilled oarsman and founded the Barnes and Mortlake Regatta – an event which still takes place each year. However, Morley’s biggest contribution came in a different sport. One of the issues which plagued the sport of football was the lack of any consistent set of rules by which it was played. The Barnes Club, as already mentioned, is now known primarily as a rugby club, but in Morley’s day it would play according to any set of rules, depending on who the opponents were and what could be agreed between them. Morley was not the first to find this situation unsatisfactory. In 1848, Cambridge University Football Club had drawn up what became known as the “Cambridge Rules” for the game. This was the first significant attempt to standardise the rules, and many clubs subsequently adopted them. But many (including Sheffield FC, the oldest football club still operating) did not. The simple problem was that CUFC was just one club, albeit a prominent one, among many and had no authority to impose their rules on any club which did not adopt them voluntarily. Morley’s solution was to create an official governing body for the sport, independent of any of the clubs playing it. In 1863 he set up a series of meetings which led to the founding of the Football Association. Morley was elected as the FA’s first secretary. One of his first tasks as secretary of the newly formed association was to draw up a set of draft rules. Morley based his rules essentially on those drawn up by CUFC. The three key aspects of the Cambridge Rules which were adopted by the fledgling FA were: a prohibition on most handling of the ball, a ban on deliberate tripping and hacking as a means of dispossessing the player with the ball, and permitting forward passes (as with existing rugby rules, many early forms of football only allowed backwards or sideways passes). The inclusion of these three rules had two significant consequences. 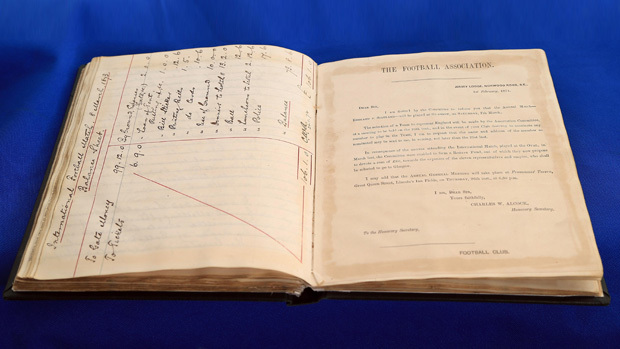 On the one hand, it formalised the split between the handling and non-handling forms of the game, with the majority of clubs who preferred the handling form declining to join the FA and, instead, becoming founding members of the Rugby Football Union in 1871. But, on the other hand, by making only minor amendments to the Cambridge Rules, the FA made it easy for clubs who preferred them to join as they didn’t need to significantly change their style of play to do so. The FA wasn’t an instant success, but from the eleven founding member clubs – all based in and around London – it had grown to 50 members from across the country when the FA Challenge Cup was instituted eight years later in 1871. By the time the Football League was launched, with the FA’s approval, in 1888 that number had grown to many hundreds and the FA’s role in overseeing the rules was essentially unchallenged. The original 13 rules of Association Football – known as the “Laws of the Game” – have changed remarkably little in the intervening period. The only major change has been the introduction of a ban on all handling of the ball, other than by a designated goalkeeper inside the penalty area – Morley’s rules had no provision for a goalkeeper, and instead allowed any player to block or catch (but not carry, throw or pick up) the ball with their hands. Other changes over the years have included tweaks to the offside system, the addition of goalbars and alterations to the definitions of fouls and their penalties. But these are all evolutionary changes, and a game of football played to Morley’s rules would still be recognisable as the same sport as the games being played in Brazil this evening. But what has this got to do with British values? Ebenezer Cobb Morley wasn’t the first to codify the rules to a sport, nor was he the last. But this is where we see a pattern. Of the world’s most popular sports, the majority of them can trace the ancestry of their rules back to this island. As well as three forms of football (Association, Rugby Union and Rugby League), Britain is responsible for the modern forms of cricket, tennis, table tennis, hockey (both field and ice), golf, polo, badminton, snooker, darts, many variants of motorsport and several winter sports (including downhill skiing and bob-sled). Of the world’s ten most popular sports, anything from six to eight (depending on how you measure popularity) originated in the UK, with Association Football being far and away the leading example. Among the exceptions, two (American Football and baseball) are themselves directly descended from sports first codified here. Only one major global sport, basketball, has no direct lineage to the UK. We may not necessarily be particularly good at playing sports, 1966 notwithstanding, but we sure as heck are good at writing the rules for them. And the principles we established have proved remarkably resilient. For all FIFA’s endemic corruption and overbearing commercial pressure, the Laws of the Game have successfully resisted excessive tinkering. In any survey of what people consider to be important British values, the rule of law is always one of the most highly placed. When people give this answer they are generally thinking of common law and statute law, of things ranging from the Theft Act to the Consumer Contracts (Information, Cancellation and Additional Charges) Regulations. But respect for the rule of law is exemplified in sport. Nobody is forced to adopt the rules of a sport. There’s no law, in the statutory sense, compelling it. But schoolchildren having a knockabout game of football in the park still conform to the Laws of the Game as far as their circumstances permit. A church cricket team playing against their neighbours doesn’t have to do as they’re told by MCC. But they do.